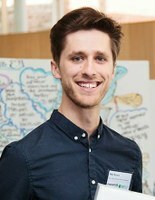 Alfie Wearn is a PhD researcher in the School of Clinical Sciences at the University of Bristol. He graduated from the University of Manchester in 2015 with a First Class (Hons) BSc in Biomedical Sciences. During this course he spent one year working in the Neurosciences department of the pharmaceutical company Boehringer Ingelheim in Germany. His research at the University of Bristol aims to help identify early biomarkers of Alzheimer’s disease using neuropsychological tests and magnetic resonance imaging (MRI).